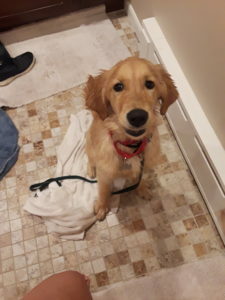 Bailey is a 5 month old female that was surrendered to GoldHeart from a breeder. Due to Bailey’s age, she will be adopted out with a GoldHeart Puppy Contract, and her forever home will need to have her spay surgery performed by age one. Proof of spay (vet invoice/spay certificate) will be required, and upon receipt, GoldHeart will reimburse her forever home up to $100 towards the surgery cost.